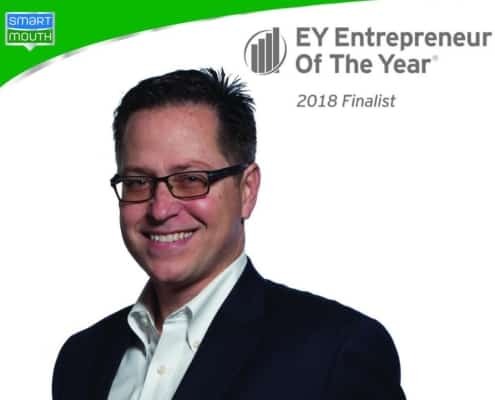 Andrew Burch, CEO of SmartMouth Oral Health Laboratories headquartered in St. Louis, Mo., was named as a finalist by Ernst and Young LLP (EY) for the Entrepreneur of The Year 2018 Award in the Heartland. ST. LOUIS (PRWEB) MAY 15, 2018 – The EY Entrepreneur of the Year Award recognizes entrepreneurs who are excelling in areas such as innovation, financial performance and personal commitment to their businesses and communities. Business leaders were selected by a panel of independent judges. Award winners will be announced at a special gala on Thursday, June 14, at the Hyatt Regency Minneapolis. Other finalists include business leaders from the heartland states of Iowa, Kansas, Minnesota, Missouri, North Dakota and South Dakota. Now in its 32nd year, the program has expanded to recognize business leaders in more than 145 cities and more than 60 countries throughout the world. Regional award winners are eligible for consideration for the Entrepreneur of The Year National Awards. Award winners in several national categories, as well as the Entrepreneur of The Year National Overall Award winner, will be announced at the awards gala in Palm Springs, Calif., on November 10, 2018. The awards are the culminating event of the Strategic Growth Forum®, the nation’s most prestigious gathering of high-growth, market-leading companies. Founded and produced by EY, the Entrepreneur of The Year Awards are nationally sponsored in the US by SAP America, the Kauffman Foundation and Merrill Corporation. Local sponsors for the Heartland program include Salo, Padilla, Twin Cities Business, PNC, Schulze School of Entrepreneurship, Lockton Companies and Pohlad Companies. SmartMouth Oral Health Laboratories manufactures and markets SmartMouth branded mouthwash, toothpaste, and mints through national retailers and online. Headquartered in St. Louis, Missouri, SmartMouth has been working to end bad breath forever since 1993.